England women's captain Charlotte Edwards has been nominated for the International Cricket Council's 'People's Choice' award for 2014. Edwards, 34, is the only female player on the shortlist, which also includes Sri Lanka captain Angelo Mathews. The five-strong list is completed by three fast bowlers - Australia's Mitchell Johnson, South Africa's Dale Steyn and India's Bhuvneshwar Kumar. The award will be decided by fans voting online and on Twitter. 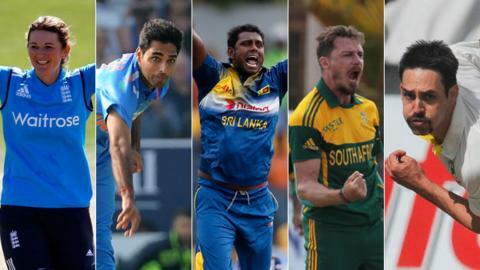 The winner, along with the shortlist for the other ICC annual awards and the Test and one-day teams of the year, will be announced on Wednesday, 5 November. Previous winners of the People's Choice award are India stars Sachin Tendulkar and Mahendra Dhoni, and Sri Lanka batsman Kumar Sangakkara. After leading England's successful defence of the Women's Ashes in Australia at the start of 2014 and taking them to the World Twenty20 final, Edwards enjoyed a stellar summer with the bat in limited-overs series wins over India and South Africa. In five completed one-day and Twenty20 internationals this summer, she scored 306 runs including a century and three fifties, and was only dismissed twice.